Vertebral arteriovenous fistula (AVF) is an uncommon vascular disorder and defined as abnormal connections of the extracranial vertebral artery or its branches into the neighboring vein or deep venous plexus. This can be spontaneous or traumatic in origin. Spontaneous cases may be congenital or associated with dysplasia of vascular wall. Traumatic cases are due either to blunt or penetrating trauma, or iatrogenic trauma. 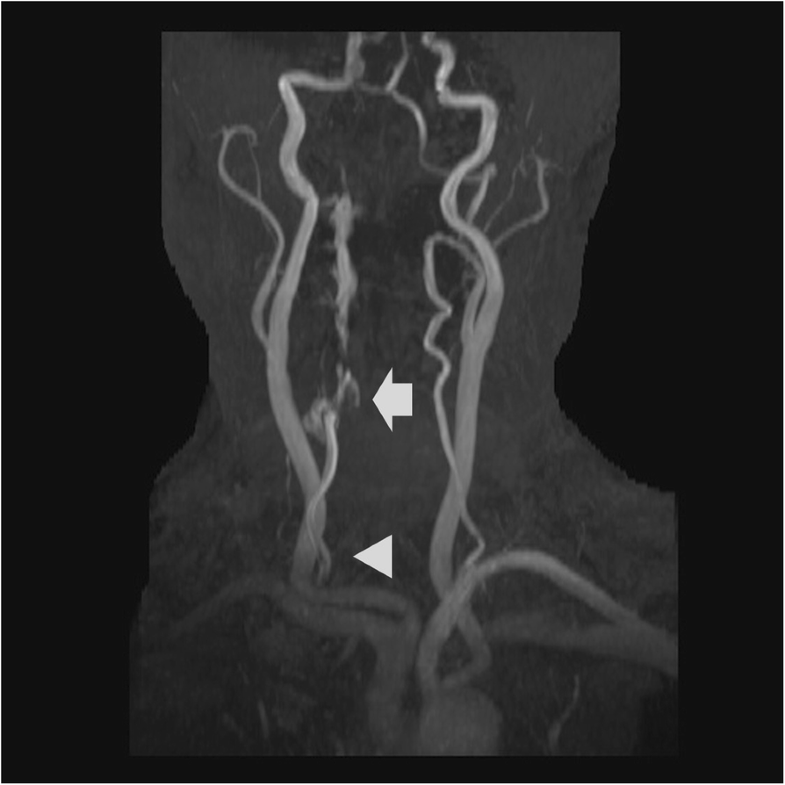 A vertebral AVF was detected by carotid duplex ultrasonography, and an endovascular treatment was successfully performed in a 72-year-old woman with 1 year history of hemodialysis. An extensive observation by carotid duplex ultrasonography is needed to detect vertebral AVF in patients who have a history of dialysis catheter insertion to internal jugular vein. Vertebral arteriovenous fistula (AVF) is defined as abnormal connections of the extracranial vertebral artery or its branches into the neighboring vein or deep venous plexus . Spontaneous cases may be congenital or associated with dysplasia of vascular wall . On the other hand, traumatic cases are due either to blunt or penetrating trauma, or iatrogenic trauma . The diagnosis of vertebral AVF relied on catheter angiography, but recent advances in non-invasive imaging modalities make the diagnosis much easier . For the treatment of vertebral AVF, preservation of the parental artery is important and must be attempted. Endovascular treatment is a minimally invasive treatment modality and does not have the disadvantages of open surgery [5–7]. Different types of endovascular approaches, transvenous, transarterial or both with coil or balloon embolization are reported [6, 8]. 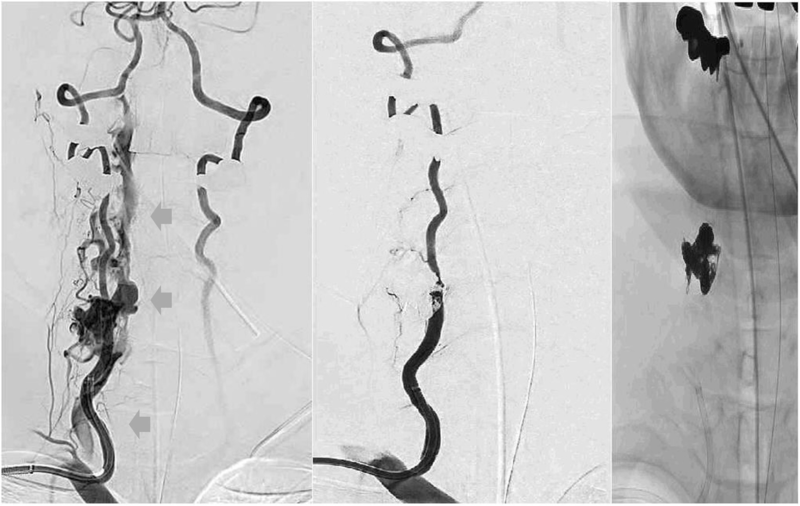 We report a case of vertebral AVF in a hemodialysis patient, first detected by the carotid duplex ultrasonography and successfully treated with endovascular therapy. A 72-year-old woman with established end-stage renal disease secondary to hypertension who was on hemodialysis for 1 year using a left upper-extremity dialysis access fistula. She had a history of dialysis catheter insertion into the right internal jugular vein at the initiation of hemodialysis. On physical examination, blood pressure was 155/89 mmHg and regular heart rhythm of 75 bpm. Auscultation revealed no abnormal heart sounds and lung crepitations. A neck bruit might be the only presenting sign, and there was a thrill over her right neck. Laboratory data obtained before dialysis were hemoglobin 11.8 g/dl, blood urea nitrogen 70 mg/dl, creatinine 10.03 mg/dl, calcium 9.6 mg/dl, inorganic phosphorus 4.0 mg/dl, N-terminal pro-brain natriuretic peptide 1840 pg/ml. Human atrial natriuretic peptide was 68.5 pg/ml after dialysis. Chest X-ray showed neither pulmonary congestion nor cardiomegaly, with a cardiothoracic ratio of 54%. Medications included ezomeprazole magnesium 20 mg/day, nifedipine CR 40 mg/day, doxazosin 4 mg/day, olmesartan 40 mg/day, azosemide 60 mg/day, carvedilol 2.5 mg/day, lanthanum carbonate 1500 mg/day, sevelamer hydrochloride 750 mg/day, and atorvastatin 10 mg/every other day. Low molecular-weight heparin was used for anticoagulation during dialysis session. The carotid duplex ultrasonography was performed for the screening of vascular wall thickness and luminal stenosis of carotid and vertebral arteries, which detected a mosaic pattern of bloodstream in the right vertebral artery with a high peak systolic velocity of 89.6 cm/s at the right C6/7 level and a slow peak systolic velocity of 30 cm/s at the right C4/5 level (Figs. 1 and 2). Cervical magnetic resonance angiography (MRA) revealed a right-sided mass lesion at C5/6 level next to the right epidural venous plexus (Fig. 3). Distal right vertebral artery was not detected. Cone beam computed tomography (CT) revealed a fistulous communication between the ventromedial part of the right C5/6 level vertebral artery and the vertebral venous plexus (Fig. 4). The patient underwent a digital subtraction angiography examination to clear up the architect of the AVF and to plan treatment strategy. Injection of contrast agent to the right vertebral artery showed a single high flow side-to-side fistula at the right C5/6 level; vertebral artery flowed into the neighboring vertebral venous plexus, then drained to epidural venous plexus in the spinal canal and finally to the vertebral venous plexus outside the spinal canal via intervertebral vein, or directly drained to the subclavian vein (Fig. 5). Although diagnosis of vertebral AVF and its accurate localization were obtained by catheter angiography, non-invasive imaging modalities such as color duplex ultrasonography, CT, and MRA can also reveal correct localization of fistula, especially duplex scan is the simplest and least invasive method. Under local anesthesia, after microcatheters were inserted into the right vertebral artery and vein, the fistula was completely occluded by 18 coils from arterial side and 3 coils from venous side. The final angiogram showed no residual filling of the fistula and a normal filling of distal vertebral artery (Fig. 5). The neck thrill disappeared immediately after the procedure. Vertebral AVF is a rare vascular disorder and can be spontaneous or traumatic in origin . Spontaneous ones are complicated by primary vascular pathologies like neurofibromatosis, fibromuscular dysplasia, Marfan’s syndrome, or Ehlers-Danlos syndrome [9, 10]. The causes of traumatic fistulas are penetrating trauma (stab wounds), blunt trauma (whiplash injury), gunshot wounds, surgical events, hyperextension injury following car accident, after nerve block injection, or by catheter insertion [2, 3]. Most traumatic vertebral AVFs involve the long second portion (intraforaminal) of vertebral artery, whereas spontaneous AVFs usually involve the third portion where the artery leaves the foramen of the atlas and enters the foramen magnum . 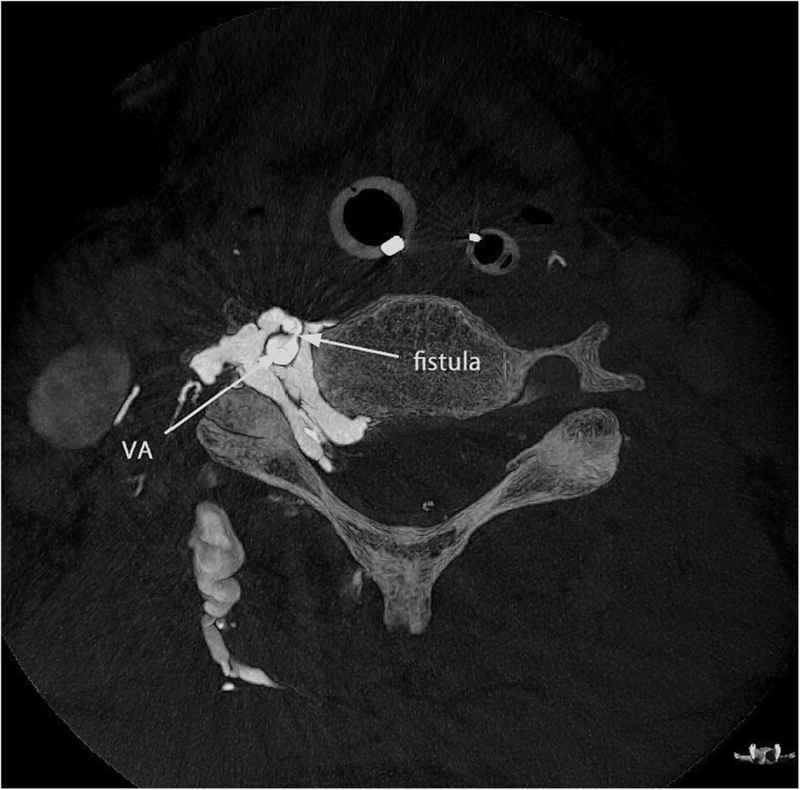 Although a spontaneous nature cannot be fully denied, fistula might have been caused by injury to the vertebral artery at the time of dialysis catheter insertion to the right neck in our case. We have investigated literatures from 1969 to 2018 by PubMed and found 31 cases describing the details of vertebral AVF that were related to catheter insertion; two of them were dialysis catheter [2, 3, 8, 12–16] (Table 1). Catheter-related iatrogenic cause is not uncommon among traumatic vertebral AVF. According to the report by Vinchon et al., 18 of 28 cases were caused by iatrogenic trauma; 14 occurred after arterial puncture during venous catheterization, 2 after direct percutaneous carotid angiography, and 2 after jugular vein puncture for Greenfield filter insertion . Other causes included surgery (two), penetrating cervical trauma (three), and blunt trauma (five) . The risk of arterial puncture during percutaneous internal jugular vein puncture has been markedly reduced using ultrasound guidance. Even if it does occur, development of vertebral AVF is a rare complication because vertebral artery runs posteriorly through inside of transverse foramen of cervical vertebra. However, as shown in ultrasonography obtained from a normal volunteer, vertebral artery runs quite close to internal jugular vein (Fig. 6), so that an erroneous puncture may accidentally occur. Anatomical variations such as goiter, ankylosing spondylitis, or even obesity might increase the risk of erroneous puncture . 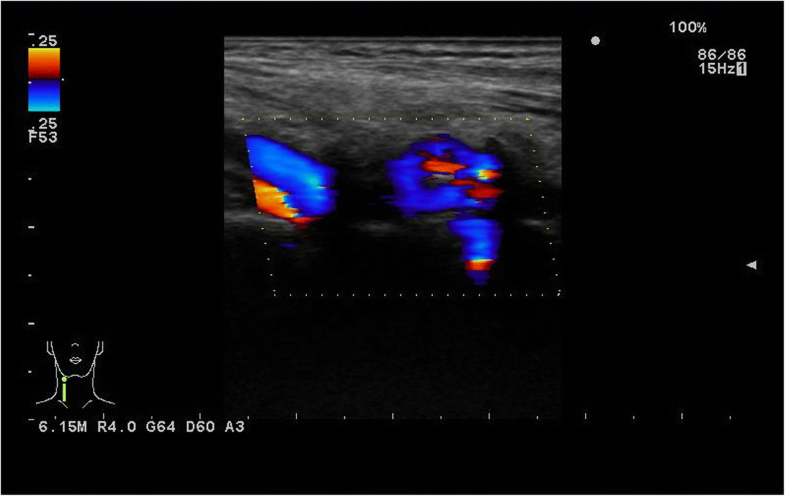 In addition, it is sometimes difficult to visualize whether the tip of the needle or catheter is remaining inside the vein even under the use of ultrasound guidance. Symptomatology depends on the site of the vertebral AVF and the flow pattern. Most of the patients are asymptomatic, and the fistula is found after systematic auscultation . Tinnitus, the most frequent symptom, is enhanced by exertion, straining, elevated blood pressure, pregnancy, and diminished or abolished by percutaneous compression or turning the head [17, 18]. Vertebrobasilar insufficiency is also common including headache and vertigo . Very rarely there are symptoms of cervical radiculopathy . Although the mechanism of cervical radiculopathy is often unclear, direct compression by dilated draining veins or a false aneurysm penetrating the vertebral canal are reported especially in Recklinghausen patients [21, 22]. AVF sometimes causes high-cardiac output state due to increasing venous return . This is very important especially in hemodialysis patients. Because they already have AVF for hemodialysis, additional presence of AVF may cause a congestive heart failure. Fortunately, she had never suffered from heart failure because AVF was so small and cardiac output was 5 L/min. Carotid duplex ultrasonography, MRA and CT are non-invasive and useful methods to diagnose vertebral AVF. 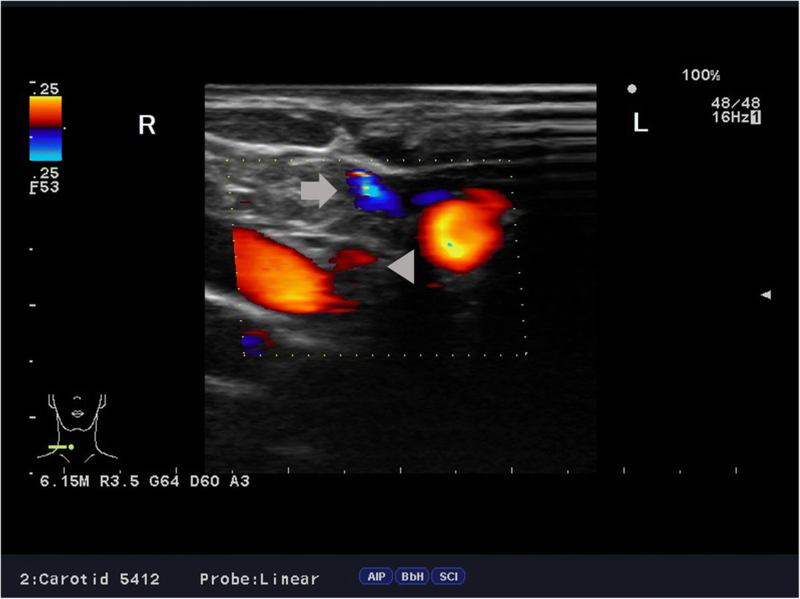 Although ultrasound is limited by operator’s ability, it is useful as the first line investigation. We found fistula incidentally by regular checkup for vascular wall thickness and luminal stenosis of carotid and vertebral arteries. The vertebral AVF was detected by a mosaic pattern of blood flow and the change in peak systolic velocity in the vertebral artery at C5/6 level, which was further confirmed by MRA and CT. The use of MRA in imaging the vertebral artery is well established . Contrast enhanced MRA was not performed in our case to avoid exposure to gadolinium contrast agent in dialysis patients, but MRA clearly demonstrated fistulous connection of arterial flow to vertebral and epidural venous plexus. The goal of the treatment is occlusion of the fistula site and preservation of the patency of vertebral artery. Open surgical repair of vertebral artery injuries is extremely challenging because of multiple factors; the most significant one is obtaining adequate exposure with proximal and distal vascular control . Surgical treatment of extracranial vertebral artery has greatly evolved in recent years, now primarily involves endovascular transcatheter therapies including coil or balloon occlusion of the fistula and stent-assisted arterial reconstruction . Intravascular coils with smaller diameters than the balloon may be used when the orifice of the fistula is too small to allow safe inflation of the detachable balloon . In our case, the embolic materials were placed both proximal and distal to the fistula via both vertebral artery and vein for the complete elimination of the fistula. A case of vertebral AVF was first confirmed by systemic auscultation and carotid duplex ultrasonography. We should be aware of vertebral AVF in patients undergoing hemodialysis who had a history of dialysis catheter insertion to the neck. KD, TN, and TI performed acquisition and interpretation of the data. KD drafted the manuscript and is responsible for the final version of the manuscript. NT and SI supported the entire process of preparing the manuscript. All authors read and approved the final manuscript. Department of Medicine, Kori Hospital, Kansai Medical University. Written informed consent was obtained from the patient for publication of this case report and any accompanying images. This project was reviewed and approved by the Kansai Medical University Review Board.